Ketchikan, Alaska - Seven personnel practiced locking out from the attack submarine USS Los Angeles (SSN 688) and ascending to the surface wearing special suits that are designed to enable a free ascent from a stricken submarine Dec. 2 during ESCAPEX at the Navy's Southeast Alaska Acoustic Measurement Facility in Ketchikan, Alaska. While several foreign navies practice the maneuver routinely, the U.S. Navy had not conducted it in more than three decades, and never from a nuclear-powered submarine. Fire Control Technician 2nd Class Gary Halsey emerges from the Northern Pacific as the first Navy Sailor to execute a tandem open ocean escape from a nuclear-powered submarine. 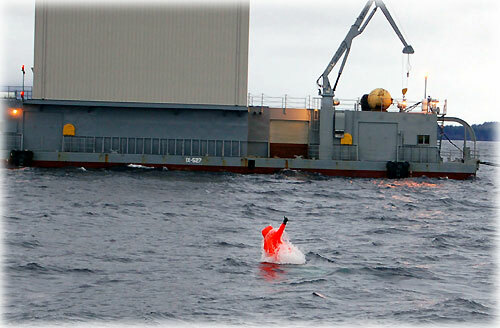 Halsey, assigned to USS Los Angeles (SSN 688), performed the feat aboard the submarine during Escape Exercise (ESCAPEX) 2006. The Navy's renewed interest in submarine escape comes as U.S. submarines operate more frequently now in shallow coastal waters, said Submarine Development Squadron (CSDS) 5 Commander Capt. Butch Howard, who oversaw the exercise. "Today, submarines spend a greater amount of time in the littorals or shallow water, which supports the overall concept of escaping from a possible distressed submarine," said Howard. "It's imperative that our sub crews be familiar and comfortable with this operating procedure no matter how remote the potential for its use." The MK10 Submarine Escape Immersion Equipment, or SEIE, allows survivors to escape a disabled submarine at depths down to 600 feet, at a rate of eight or more men per hour. It is designed to enable a free ascent from a stricken submarine and provides protection for the submariner on reaching the surface until rescued. The assembly is comprised of a submarine escape and immersion suit, an inner thermal liner and a gas inflated single seat life raft, all contained in an outer protective stowage compartment. For the exercise, Los Angeles embarked six U.S. Navy divers, as well as a British diver from the Royal Navy. The submarine submerged to 130 feet, where each of the seven divers donned the SEIE suits, entered the escape trunk, and ascended. Chief Navy Diver (DSW/SW) Sean Daoust, a submarine escape instructor at the Naval Submarine School in Groton, Conn., was the first to ascend. Daoust said he was honored to be the first to escape from a U.S. nuclear-powered submarine, and couldn't wait to return to his students with his firsthand knowledge. 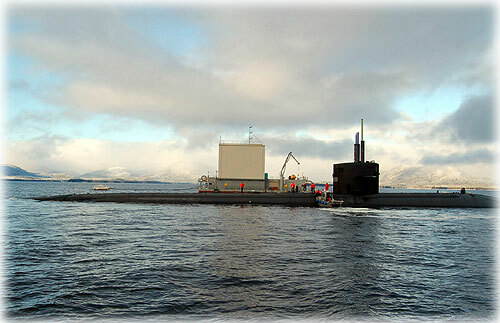 Fast attack submarine USS Los Angeles (SSN 688) is moored at the Southeast Alaska Acoustic Measurement Facility Static Site in Ketchikan, Alaska, as part of Escape Exercise 2006. "First and Finest," Los Angeles was the first nuclear-powered U.S. submarine to conduct an open ocean escape. "I teach this procedure on a daily basis," said Daoust. "I have a lot of confidence in the system. Now I can show them the data and the statistics so it will benefit them, because if you see one of your shipmates being blasted out of a submarine, it's the best way to ensure them the system works." After Daoust, there were three tandem escapes. Los Angeles crew member Fire Control Technician 2nd Class (SS) Gary Halsey was one of the Sailors given the chance to participate in a tandem escape. While thrilled at the experience, Halsey also said it was reassuring to know that the escape system works. "Not many people get to do things like this in their whole Navy career," said Halsey. "The SEIE worked great, which instilled confidence, not to mention being very comforting to all of us working on submarines." Cmdr. Erik Burian, commanding officer of Los Angeles, attributed the exercise's success to his crew's tremendous skill and professionalism. He said he was grateful that the namesake of the Los Angeles class was the boat selected to do the exercise. "I think it's absolutely fitting the 'first and finest' pulled this off," said Burian. "It's just perfect." Submariners can have an added degree of confidence in knowing that the SEIE suits on U.S. submarines can save them in the unlikely event of a stranding, said Howard. "As a result of ESCAPEX, we've confirmed the procedures and our SEIE suits work," he said. "The ship and the folks at SEAFAC [Southeast Alaska Acoustic Measurement Facility] did a great job." In addition to the team from CSDS 5, Los Angeles and SEAFAC, the ESCAPEX team was made up of members of numerous commands, including Commander, Submarine Force Pacific Fleet, Naval Sea Systems Command and Explosive Ordnance Disposal Mobile Unit 11.